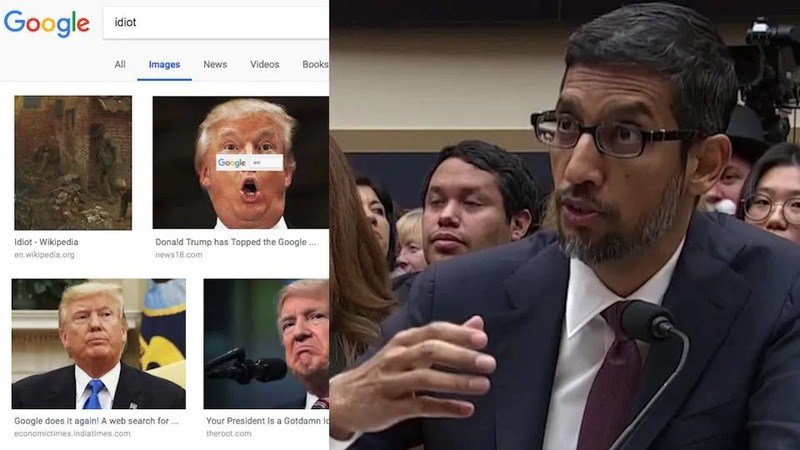 Home / Latest News / Congresswoman to Google CEO: Why when I search ‘idiot’ do I get pictures of Trump? With an end goal to see how Google seek calculations function, a Democratic congresswoman asked the tech organization's CEO an honest inquiry: "On the off chance that you Google the word 'dolt' under pictures, an image of Donald Trump comes up. How might that occur? How does look function with the goal that would happen?" Amidst a congressional hearing apparently about security and information accumulation, Rep. Zoe Lofgren (D-Calif.) appeared to play out that seek from the dais. Things being what they are, the picture results for "blockhead" reveals a page of generally Trump photographs. Google CEO Sundar Pichai, who was affirming Tuesday morning before the House Judiciary Committee, attempted to disclose to the roomful of generally tech tenderfoots how the calculations consider around 200 elements —, for example, pertinence, notoriety, how others are utilizing the hunting term — to decide how to best match a question with results. "So it's not some little man sitting behind the drapery making sense of what we will demonstrate the client. It's fundamentally an assemblage of what clients are creating, and attempting to deal with that data?" Lofgren asked, playfully. Lofgren was responding to Republicans' claims that Google workers control results for political reasons. The consultation, for the most part, uncovered legislators' simple comprehension of how the Internet functions and gave a stage to them to whine about horrible indexed lists. In one trade, Rep. Lamar Smith (R-Tex.) asked Pichai whether he had ever guided a representative to control query items. Pichai clarified that it's impractical for one individual, or even a gathering of individuals, to do that because there are such a significant number of ventures simultaneously. Be that as it may, Smith did not acknowledge that clarification, telling Pichai: "Let me simply say, I oppose this idea. I figure people can control the procedure. It is a human procedure at its base." Republicans on the board couldn't move beyond the legend that some person(s) inside Google couldn't self-assertively change look calculations for political gain. Rep. Steve Chabot (R-Ohio) grumbled that when he googled the Republican social insurance bill or the GOP tax reductions the initial a few pages recorded negative articles. "How would you clarify this obvious predisposition on Google's part against traditionalist perspectives, against preservationist approaches? Is it simply the calculation, or is there all the more occurring there?" Chabot inquired. "Congressman, I comprehend the disappointment of seeing negative news, and, you know, I see it on me," Pichai advertised. "What is imperative here is we utilize the power system to reflect what is being said about some random theme at a specific time. Also, we attempt to do it dispassionately, utilizing an arrangement of rubrics. It is to our greatest advantage to ensure we mirror what's going on out there in the most ideal target way. I can focus on you, and I can guarantee you, we do it without respects to the political belief system. Our calculations have no thought of political opinion in it." In any case, Chabot didn't have it. He revealed to Pichai that traditionalists trust Google is "picking victors and washouts in political talk." "Many individuals think what I'm stating here is occurring," Chabot said. "Also, I believe it's occurring." One Democratic administrator had a blunt message for his Republicans whining about Google looks. "On the off chance that you need positive indexed lists, do positive things. On the off chance that you don't need negative indexed lists, don't do negative things," said Rep. Ted Lieu (Cali.). "Furthermore, to a portion of my associates over the path, in case you're getting awful press articles and awful list items, don't point the finger at Google or Facebook or Twitter, consider reprimanding yourself."